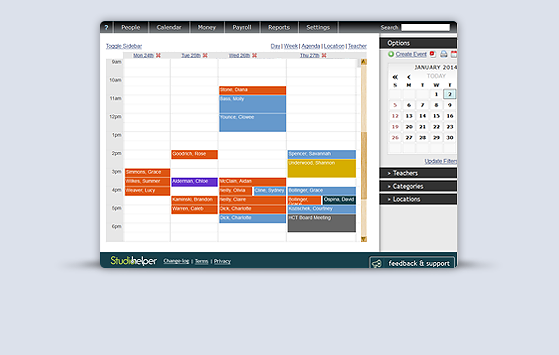 Studio Helper | Studio Helper is web-based studio management software that simplifies your life. Or sign up for a free 30 day trial. No credit card required. Keep track of everyone in your studio (students, parents, teachers, staff). Send mass emails. Assign "to-do" items. 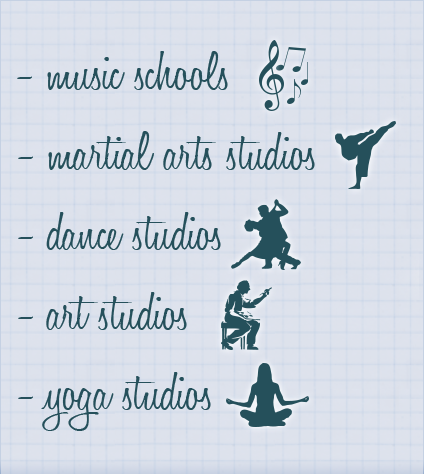 See a live calendar of all the lessons and events in your studio. Control which teachers and rooms you want to see. Send reminders and track attendance. Invoice your clients and receive payments online. Track expenses and inventory and run reports for taxes. Join TodayFree 30 day trial. No credit card required. I recently started using Studio Helper and just have to say -- this program is so cool! It'll be an incredible asset as my husband and I transition to our larger studio in the next year. Studio Helper is indispensable to my studio. Studio Helper is indispensable to my studio. Your web-based management software makes it possible for me to teach and manage a studio of 5 teachers and more than 100 students. Studio Helper is there for every step of my small business. A student registration box is embedded in my Magnolia Music Studio website and the registrations are automatically entered into Studio Helper. I generate and email Studio Helper invoices that can be paid online using PayPal, or students have the option of paying onsite or by mail. 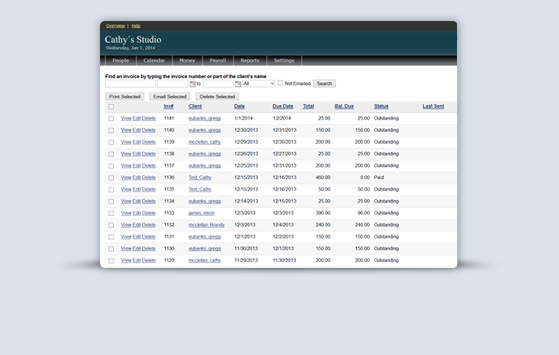 The online calendar enables ALL of the studio teachers to access and schedule their own students and teachers can select automatic email reminders sent to students to reduce "no shows" and forgotten lessons. Another service of Studio Helper is the ability to send mass emails to select students from any teacher or the studio director. There are numerous handy features and I am thrilled with the technical support and quick personal responses from the Studio Helper team. It is clear that they understand the unique challenges of managing independent music studios. The is software for music teachers created by music teachers, innovations for studio owners created by studio owners. Thank you, Studio Helper! Studio Helper saves time and money for any small business owner that wants a way to easily manage their employees, clients, and key business metrics such as revenue and profit. 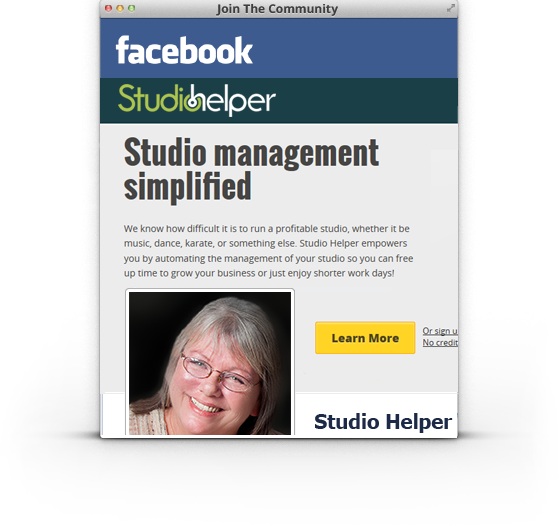 When you join Studio Helper, you join a thriving and growing network of studio owners from around the world. This is an amazing place to discover new ideas, learn tips on running your studio, and make new friends. 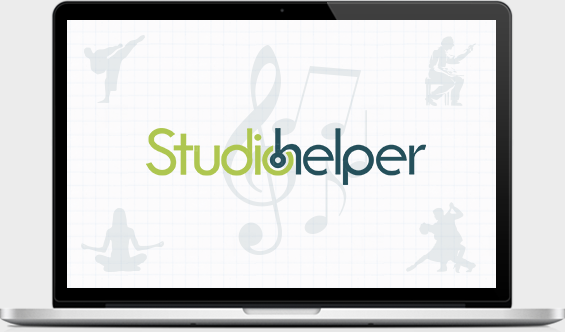 Try Studio Helper free for 30 days. Simple pricing ensures you only pay for what you use. $50/month + 25 cents per student. Contracts are month to month. You can cancel anytime, and there are no extra fees or charges. If you decide to cancel, you can download all your data to your computer. We don't hold your data hostage. Give it a try today! You're free to play around with it as much as you like during your free trial. If you decide it's not for you, your account will just expire - no need to cancel. But we think you're going to love it! If you have any questions, you can contact our support team, and we're happy to help you out. Can I allow teachers to create their own schedules? Absolutely. When you give a teacher a username or password from within their profile, they will have the ability to login and setup their own schedules, mark attendance for lessons they've taught, and write notes about how it went. If you do not want teachers to have this ability you can either not give them a username and password, or you can specify what you want them to be able to do under Settings - Permissions. What do my students see when they login? Music TeacherYour students will only see their own information, and cannot see information about other students in your studio. Students can see their own lesson schedule, lesson history, etc. Parents will see this information for all of their children, as well as billing information such as their own payment history. Teachers will see the schedules of the students they are teaching as well as lesson attendance. Staff members will see almost everything you see. If you want a certain group to have different permissions than they currently do, you can customize who can see what, by clicking "Settings" - "Permissions"
How do I give others access to the website? To allow your staff, teachers, students and their parents to login to your Studio Helper account, they will each need their own username and password. 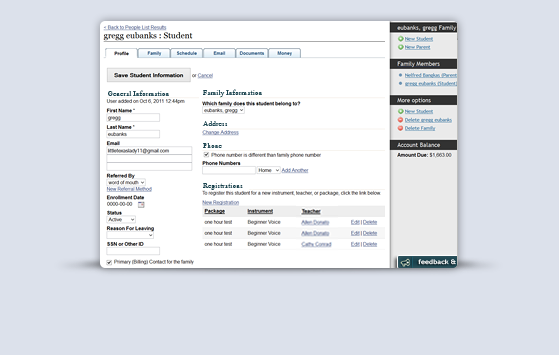 You can assign a username and password from within each user's profile, or you can have the system automatically generate a username and password for each student and email it to them. To choose their username yourself, click their name from the People List, and type a username and password for them in their profile. (Make sure you click the "Check Availability" button to make sure the username isn't already taken). Usernames must be unique system-wide. To have the system generate usernames for your students, go to the People list, click "Students" to show all students (or you could do a search and select specific people). Check the box next to the names you want to generate a login for. To select all, just click the checkbox above the list. When you check a box, a "With selected" box will appear. From there, just choose "Reset Logins", and the students will be sent a new username and password. Once the user has a username and password, they'll be able to login. They will also be able to change their username and password once they login. (Note: Students who you mark with a status of "Former" will not be able to login). How safe is the information I put into Studio Helper? Security is a big concern for many studios, as it should be whenever you're storing important information on the Internet. You'll be pleased to know that Studio Helper protects your information using SSL encryption, which is the same technology bank websites use to secure their data. We also back up your information daily on separate servers in multiple states to ensure your information is protected. And your data is always yours - we don't hold it hostage. So you can export your studio data to save it as a file on your computer at any time for your own records. Are there fees for accepting online payments from my students? If you choose to allow your students to pay you online, the merchant provider you choose does take a small percentage (usually 1.9%-2.9%, plus sometimes $0.10 - $0.30 for a transaction fee, depending on your volume). Many studios choose to pass this fee on to their students in an extra line item on the invoices. Most students are generally more than happy to pay a few extra bucks for the convenience of online payments. Or you may choose to foot yourself the bill since it's a convenience to you as well. The choice is yours. To setup on-line payments, simply go to the "Settings" -> "Studio Info" page, and choose whether you want to allow students to pay via Paypal, Authorize.net or both. There are also links to setup accounts with each of these providers if you choose. Once these options are enabled, then Studio Helper will automatically put a link at the bottom of each invoice, allowing your students to pay you. How do I integrate my current website with Studio Helper? 1. Simply link to the "Login" page of Studio Helper (https://www.studiohelper.com/login) from your existing website. 2. Go to Settings -> Remote Access. There you will see some code you can place on your website to integrate with Studio Helper. For example, you can put a login form, or a registration form on your website. When students fill out the registration form, you will be notified via email, and the student's information will automatically be entered into Studio Helper. What is the Studio Helper Team’s Favorite Recipe? So glad you asked! Pretty much anything NY Times food columnist Mark Bittman whips up in the kitchen. Here he picks 25 favorites from his own food column. Just make sure you dash off to the kitchen after you sign up for Studio Helper. Support is only a click away! 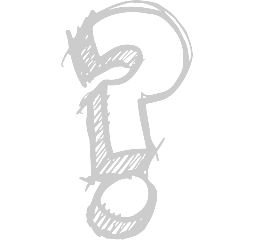 If you can't find an answer to your question using one of the above methods, please don't hesitate to contact us via Email. Email support is available from 9 AM to 5 PM EST Monday through Friday, closed on weekends. You'll soon see why teachers all over the world rave about our customer support. If you are struggling to set up your studio, we can help! We offer free customized start up calls to help you get your Studio up and running. Please contact support at 1-800-517-2811 or support@studiohelper.com to schedule a time for a personalized custom start up call. Please have three available times available so that support can coordinate and schedule a time that works for you as well Cathy Conrad, who conducts the start up calls.